NOTICE: There are plans to perform "controlled" burns in Linville Gorge. Please see Save Linville Gorge Wilderness for details. Everyone's support is needed! The Linville Gorge Wilderness is a Federal wilderness area in western North Carolina managed by the US Forest Service. 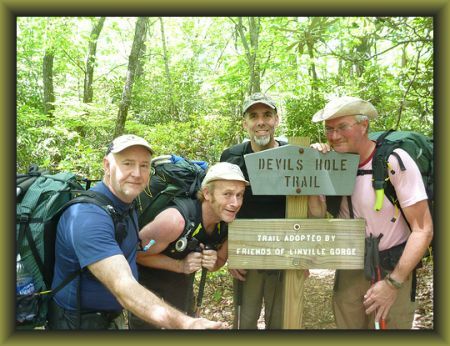 This website is intended to gather and share information on Linville Gorge hiking and backpacking. The site contains collections of gps waypoints and gpx files, maps and some photos. Our forums contain boards for discussion of all aspects of Linville Gorge, along with a special section on trails which is a front end for our trail database. We are continually gathering new data about Published as well as "unpublished" Linville trails. The Gorge is a mecca for campers, hikers, climbers, scramblers and simply anyone who loves nature and being in the great outdoors. This is rugged country, with something for everyone. There are many hikes that take you to the Linville River for fishing, camping, more hiking, or just listening to the water and soaking your feet. Other trails follow the cliff edges with fantastic views of the river valley and the opposite cliffs. The east and west ridges are dotted with many small canyons to explore. These contain interesting creeks, canyon walls, occasional waterfalls and lots of rugged beauty. Linville Gorge will keep calling you back so be prepared to spend some time there. Feel free to use this website to learn all you can about this special place. Thanks for visiting.